As you can guess, the Trucker has never been down for more than a few hours, and that’s usually due to me wrenching on it. So this bike did not see much riding for the first few years, and has gone through an incredibly wasteful series of incarnations as I try to figure out the appropriate build that would make it a comfortable and desirable ride. After giving up all further attempts at drop bars because my neck just can’t handle it, we’re back to Albatross bars. The bike is also running knobbies, not because there is a lot of dirt in the future, but because these tires can be pulled on and off the rims without any tools. I’m also trying to keep it light and simple, although the lights and wiring are a must-have for the amount of night riding I do. Frame: Nashbar large (appx. 58cm) cyclocross aluminum frame with ovalized oversized tubing, tig welded. Finished in matte black and will accept a rear disk brake. It cost $85 through NB’s returned goods page. I had to order the derailleur hanger insert separately. Fork: No name steel uni-crown cross fork that I painted with black grill paint after grinding down the lawyer lips. It cost all of $10 on Ebay, and I have another one ready after they screwed up the original order and sent me two. Stem: Specialized 12cm with a slight rise. Bars: Nitto Albatross wrapped with Anatomica leather. I find these are great bars for any ride under 30 miles, and just put a smile on your face. They create a comfortable upright position that completely removes any semblance of the racer vibe. They would be perfect if they could be angled out a bit more. Brake Levers: Tektro BMX. They’re a bit on the short side, but two fingers can lock them up easily. 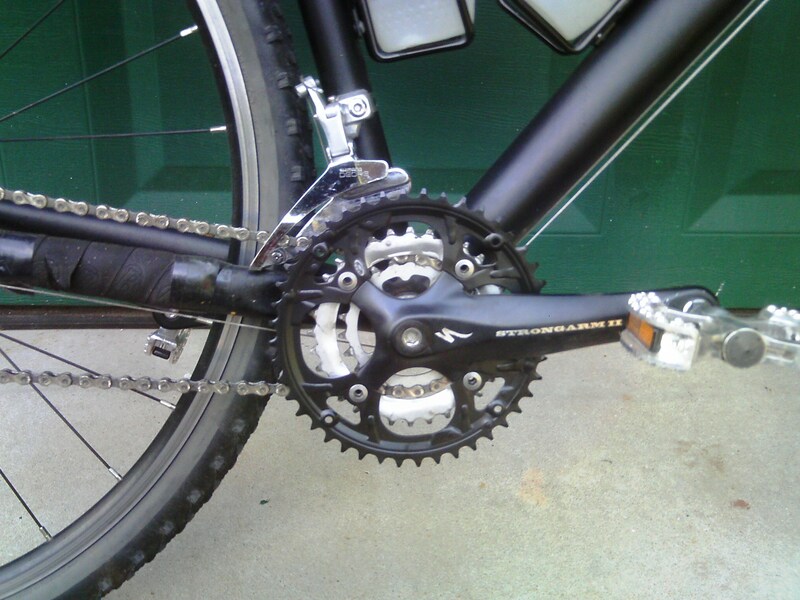 Shifters: Shimano 8 speed barcons. The little disk insert has worn out, so they are set for friction. Computer: Planet Bike Protege 9.0 Wired. I’ve had one of these on the LHT for years and really like the size of the readout, the auto-start, the temperature function, and the bomb-proof build. They also are set up for two wheel sizes, so I have both bike computers configured to be interchangible. 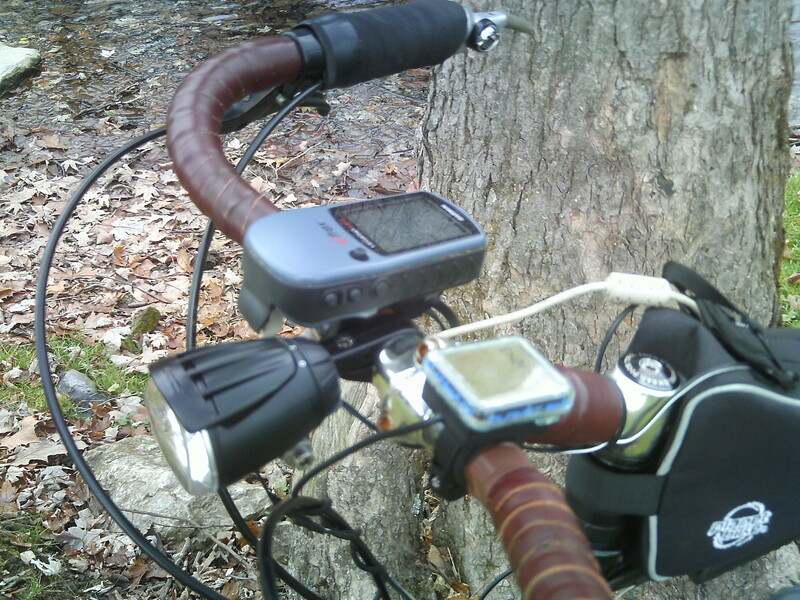 There is also a clamp for mounting the Garmin GPS, which comes in handy for rides into parts unknown, as well as having a backlit display after dark. Mirror: A really cheap Bell. The optics are terrible, but still good enough to let me see any cars coming up from behind. Plus, its really easy to adjust. Stem Bag: This is a Planet Bike Lunch Box which has proven really handy for odds and ends, plus the random granola bar or banana. Brakes: Tektro V’s with Kool Stop Salmon mountain pads and pulleys replacing the noodles. Simply put, this is the strongest yet best modulating setup I’ve ever used. Saddle: Currently a heavily modified Selle Titanico. It has been stretched out, tied, trimmed, and bent. 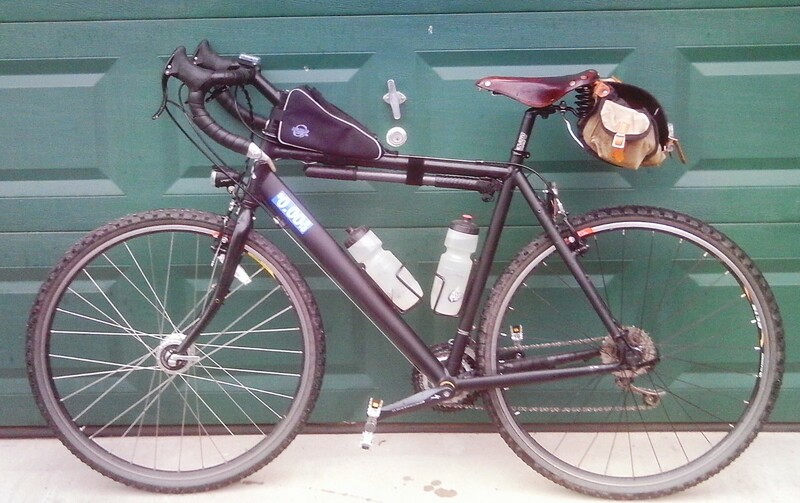 It’s reasonably comfortable; but I could change it in a heartbeat if I thought another saddle might work better. Seatpost: Black anodized Trutaviv with a healthy 25mm setback. It’s a budget model, but has good adjustment and is plenty stiff. 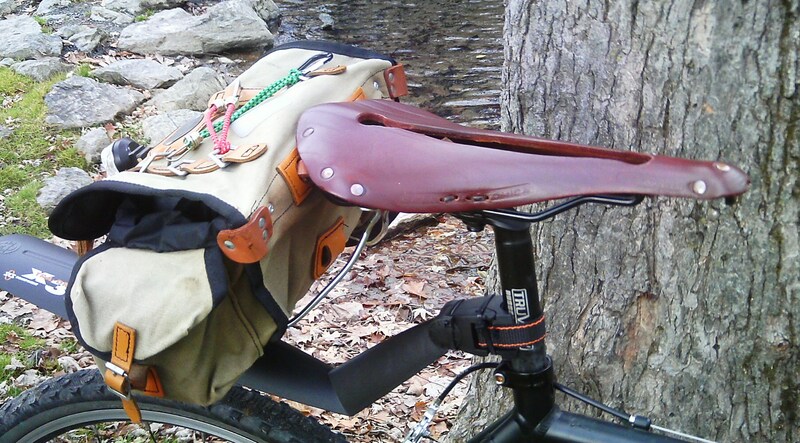 Saddle Bag: Carradice Barley, supported by a Midlands rack. This bag is really too small for a day trip, but it works well for stuffing in a few Powerbars and enough room for a jacket if it looks like rain. I’ve inserted a homemade plastic backing cut from a cat litter bucket to help it keep its shape. The side pockets are filled with some basic tools, some tire irons, a patch kit, and a spare tube. Front Light: Bucsh and Muller Cyo Premium. This is new as of November 2015, and the beam blows me away. 80 lux, very smooth with no hot spots, and wide enough to cover a two lane road as well as the berms. 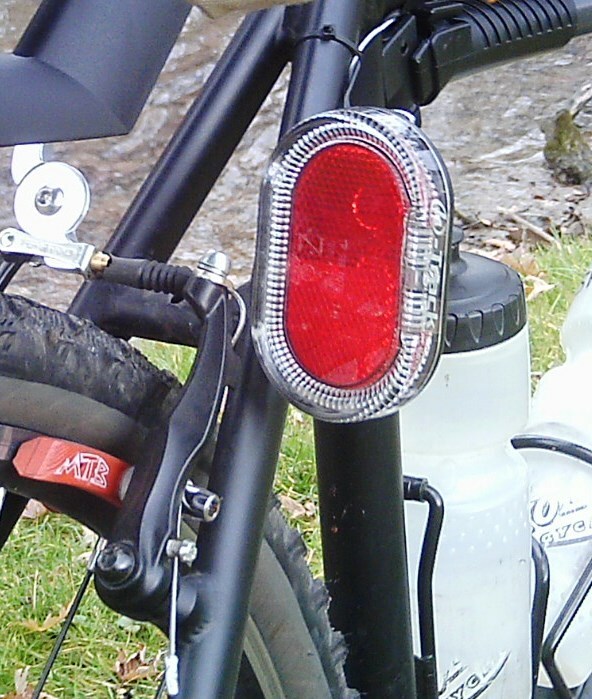 Rear light: This is an inexpensive Finnish product: Herrmans H-Track. It’s very bright and feeds into a nice sized reflector. It doesn’t have an off switch, so it remains lit until the capacitor drains. 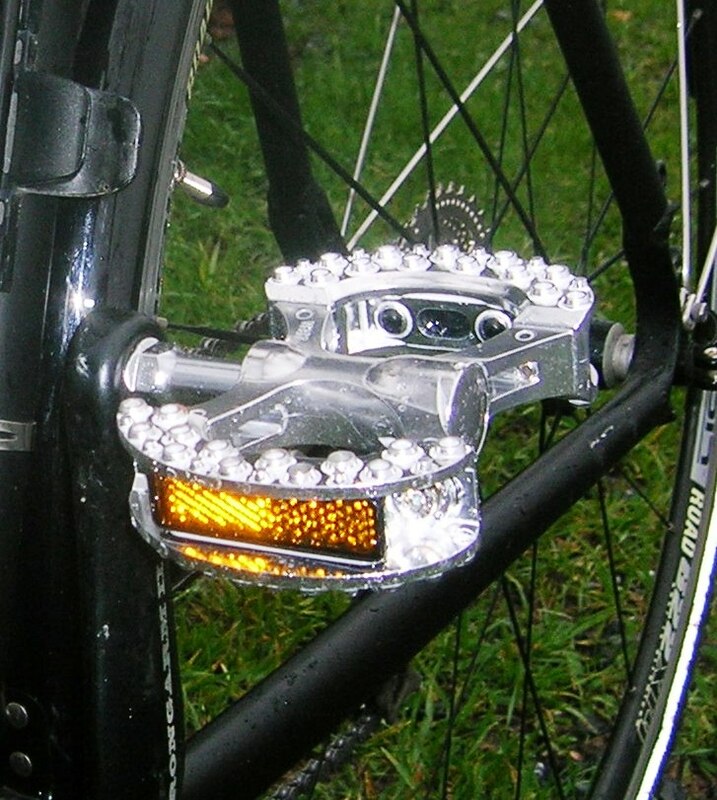 The spare light is a Planet Bike Superflash. What can I say? The best battery powered rear light currently made. Wheels: The front is an Alex ACE19 rim, 32 spoke, with a Shimano 3N71 Dynohub. 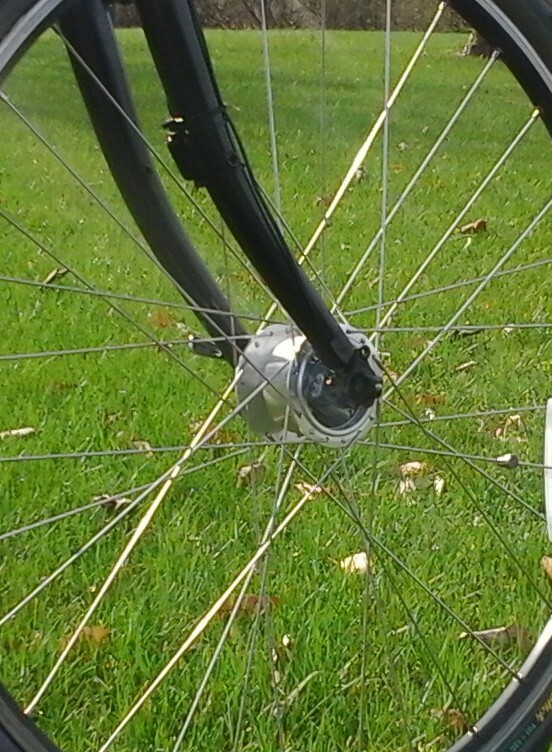 The rear is an Alex DC19 rim with Dimension hub. Both wheels are hand-me-downs from the LHT. The rear is spaced for 135mm, and the frame is supposed to be 130mm. After checking some reviews, I found a fairly common, but not strong “concern” that the spacing was more like 133mm and that road wheels had to be pinched into the frame. I didn’t bother to measure, but I just pulled the chainstays out ever so slightly and the wheel fit. It’s nice knowing that I can change around wheelsets for both this bike and the LHT. If this bike gets the use that I’m hoping for, I think a stronger rear wheel with a better hub would make sense. Tires: Kenda Cross 42c knobbies. 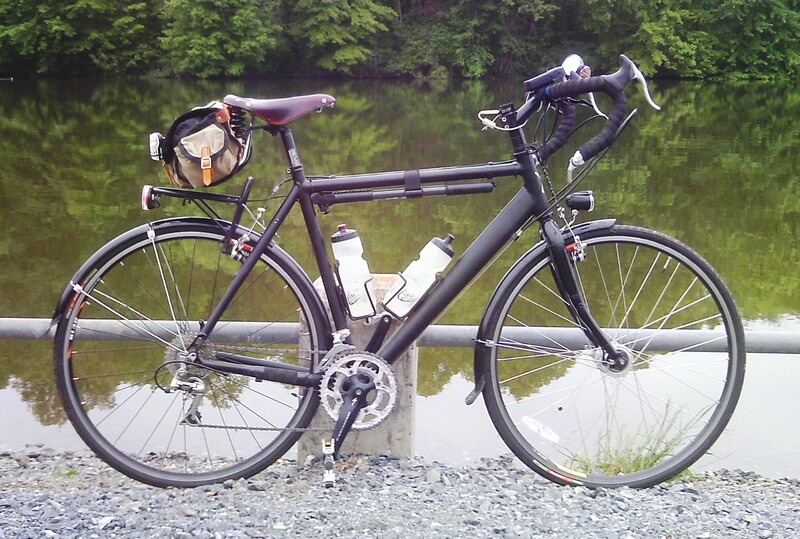 They just fit in the frame, but provide a cushy ride with the light sidewalls. They also are really easy to get on and off the rims, which is a trait I’ve really come to appreciate in a tire/rim combination. 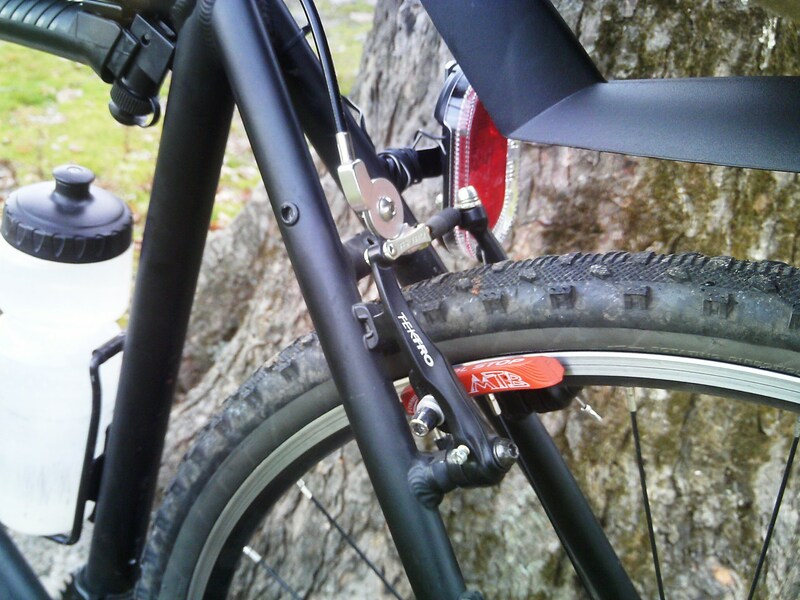 Front Rack: Another of those cheap Nashbar brake stud mounted things. They just really come in handy and they stay out of the way. 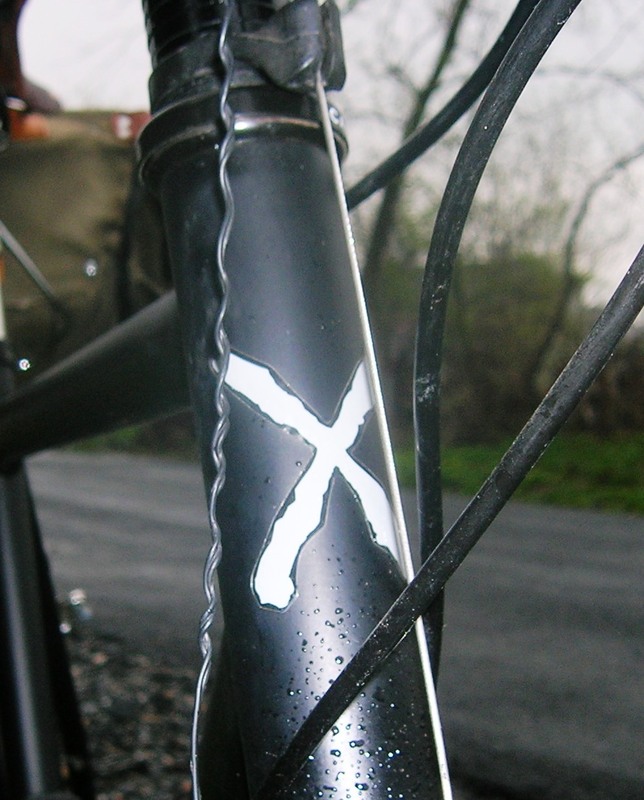 Mudguard: SKS X3. It’s new so I can’t say much about it. I already broke the latch, which I have secured with zip ties. I was planning on that anyway since these things have a tendency to disappear when bikes are parked. Crank: Specialized Strongarm triple (mountain). 175mm. 44/32/22. It’s got some nice low gearing for grinding up steep hills with a load. Pedals: MKS Lambda. Originally I had some cheap Dimension platforms, but after riding with the Lambdas (Grip Kings) on the LHT for so long, they just feel right. No clips for me! Cassette: 8 speed Megarange, 11X34. Pump: Mt. Zefal. There are a lot of options for frame pumps, ranging from cheap lightweight plastic tubes to high end alloy units with pop-out handles, flexible hoses, floor stands and guages. Weighing cost, ease of use, weight, size, and reliability can be daunting; because you may only need a frame pump once. But that once might be critical. The Mt. Zefal pump seemed to be “just good enough” in all of the above categories. Kickstand? Nope. I did have a Greenfield chainstay stand mounted on the frame, but the ovalized tubing caused it to align strangely. Once over-torqued, the mounting plate cracked. Although it held the bike fine, the looks of it bothered me. 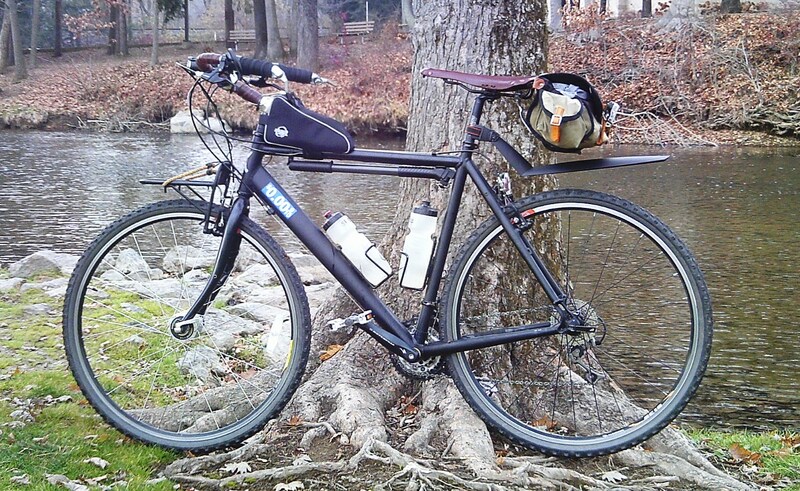 Once I decided to keep this bike as light as I reasonably could, I opted to pull the stand altogether. There isn’t really enough room at the bottom bracket for a conventional stand. Nice. AGGGGHHHH that sticker again…do you sell them? I WANT SOME!!! I really like the overall look of the bike — I’d love to build up one similarly. thx Johnny. It’s a blast to ride. It’s just a matter of time before I take it on some extended rides on some rougher trails in this region. I think it will work perfectly and be so much more responsive than an MTB.